Recently I have found myself becoming more pugilistic and less pusillanimous. Or, to use fewer ‘pu’ words, more disputative and less tentative. Simpler still – and with apologies to women and rats – more man and less mouse. 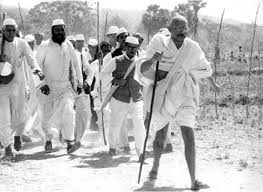 Not for me the Gandhian civil disobediences and passive salt marches of yesteryear. No, never again will I walk the long route to buy condiments. Gandhi’s passivity ruined a good pair of sandals, when he could have bought the salt locally and yes, even forcefully. My refusal to be pushed to the back of the queue in the supermarket spice section is just one minor example of my newfound capacity to stand up for myself. It also fits nicely with my new preferred descriptor, ‘seasoned warrior’. It all began with a few letters to the editor in the online medical media. I padded up nonchalantly for replies, but soon found myself facing Mitchell Johnson on a dry Perth wicket. After one letter about transparency last year, an anonymous GP suggested I should be “publicly shamed in the stocks for such an unresponsible statement and I would love to be the first tomato thrower”. That non-conflicted doctor was so angry he even forgot to proofread his comment before publication. But was this seasoned warrior worth his salt? I adjusted my cricketer’s box and angled my groin to the bowlers again. I collated evidence onto a website called No Advertising Please and suggested doctors read the information to decide whether they wanted to continue seeing drug reps at work. No suggestion of any restriction or regulation – just encouraging clinicians to consider making a personal decision. Admittedly, I could simply have kept my head out of ballistic tomato range, but the response to my awareness-raising concept was hairier than a Putin shirtfront. “I can understand these laws have been enacted to counter terrorism and miscreant bikie gangs!” Not sure what that meant, unless perhaps that reader got wind of my expansion campaign to incarcerate GPs who consort with three or more reps in a public space. “Banning the reps is the same logic for wearing Burqua’s.” Absolutely no explanation followed, so I’m still unclear where that GP stands if their rep turns up wearing a burqa. In the end, I should just be grateful that the pharmaceutical industry body Medicines Australia described me as “laughable at best and negligent at worst”. After all, ‘laughable at best’ is my dream goal for this blog’s flippant columns. This entry was posted in writing and tagged advertising, Flippant, Medical Observer. Bookmark the permalink. Mahatma Gandhi was a peculiar person. He walked barefoot everywhere, to the point that his feet became quite thick and hard. He often went on hunger strikes, and even when he wasn’t on a hunger strike, he did not eat much and became quite thin and frail. He also was a very spiritual person. Finally, because he didn’t eat much and when he did his diet was peculiar, he developed very bad breath. He became known as a super-calloused fragile mystic hexed by halitosis. Love it! Your column inspired me, Justin…. here is my response. http://genevieveyates.com/2014/11/20/the-best-haters-are-the-worst-spellers/ My tribute to your pugilistic and deliciously laughable approach. I’m from the chronically ill community – more than anyone else, we need someone to believe in. My concern raised at http://blogs.bmj.com/bmj/2013/09/10/richard-smith-is-the-pharmaceutical-industry-like-the-mafia/ is what eventuates from healthcare industry introspection? “…outrage will discourage adherence to beneficial meds, and shatter the hopes of those patients suffering syndromes without a treatment.” Already vulnerable to maverick super-fixes, the likes of Prof Peter Gøtzsche sanctimoniously preaching that research doctors can’t be trusted leaves us disillusioned about our GP’s evidence base. Let alone your vulnerability to irresistible trinkets then influencing prescribing practices. You take advice from your biro? I’m sticking with wikipedia.